This earthcache was orignially posted by Bernd das Brot Team. It is being revied with permission. 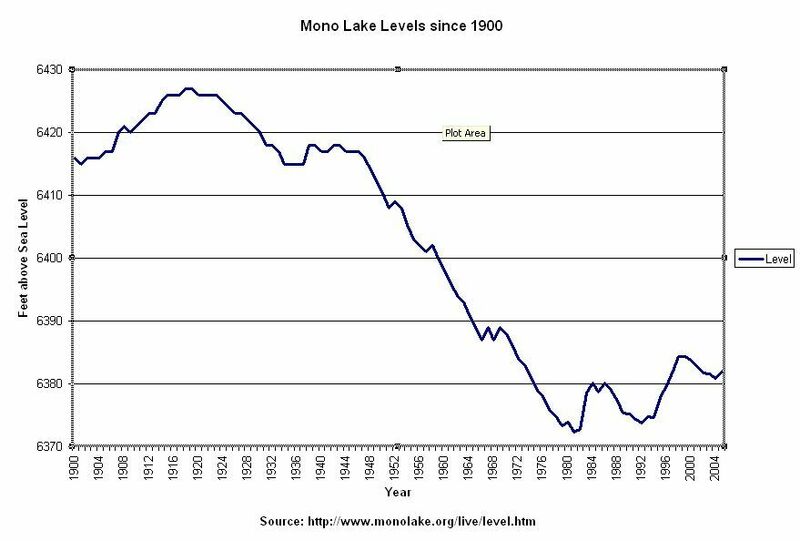 This looks at the water balance of Mono Lake. The posted coordinates require a fee, but the alternate coordinates provide free access. This was once under water. When calcium-rich springs flow up through the lake bottom, the calcium bonds to carbonates in the lake water. Together they form calcium carbonate, a type of limestone. This solid material builds on itself, gradually forming a tufa tower. When the lake level drops, the exposed tufa stops growing. 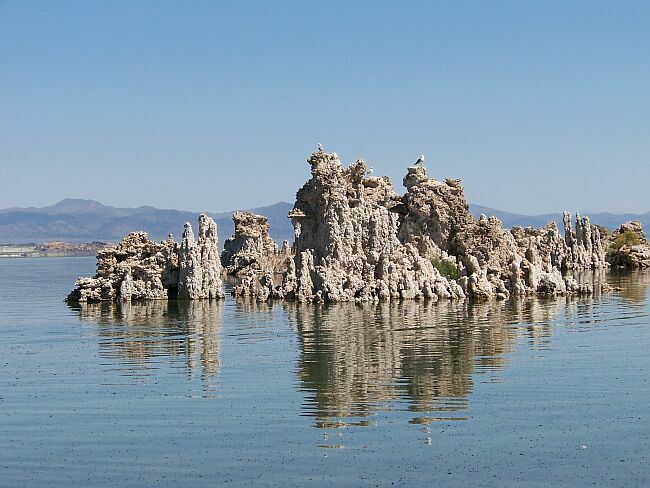 California’s Mono Lake is a prime example for the detrimental influence of human population on ecosystems, but also an example of growing awareness and an attempt to right the wrongs of the past. The lake has endured at least 760,000 years of dramatic geologic history. However, within the last 100 years, human demands have posed the greatest threat to its continued health and existence. In 1941, the Los Angeles Department of Water and Power (LADWP) began diverting water from Mono’s tributary streams. During the next 40 years, lake salinity nearly doubled; stream and waterfowl habitat disappeared, and large alkali flats emerged as the lake lost half its volume. A declining ecosystem, increasing dust storms, and dwindling waterfowl populations began to raise concern. In 1978, the Mono Lake Committee formed to educate the public about the plight of Mono Lake and to search for solutions to the problem. Education and a growing awareness of Mono Lake’s plight led to an organized effort to reduce its decline. 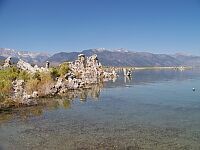 Individuals, environmental groups, government agencies and LADWP became involved in a long, controversial struggle over Mono Lake’s water. 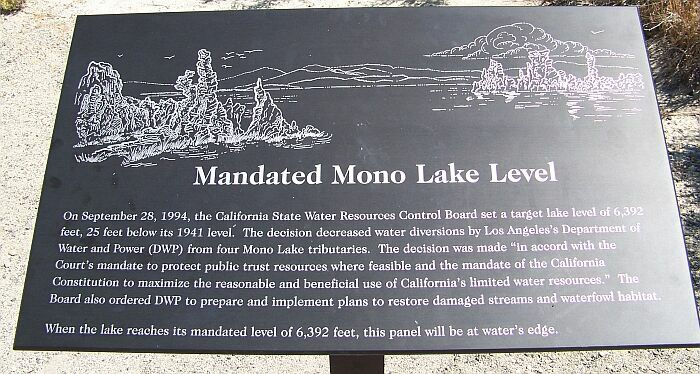 In 1994, the California State Water Recourses Control Board decided that Mono Lake will be maintained at an elevation of 6392 feet – 20 feet above its historic low in 1982, but still 25 feet below the 1941 lake level. Diversions will continue in the Mono Lake Basin, but at a reduced rate, which will allow the lake level to rise. We talked to rangers at the South Tufa Area and the Mono Lake Visitor’s Center. There are tons of tables and diagrams, documenting the lake level (the current levels can be found here), but apparently nobody has been taking pictures from the same location to create visual evidence of the change for the better. Both rangers though a picture documentation would be a great idea. Click thumbnail for larger pictures. Once the lake has reached its final level, the collection of pictures will be presented to the Mono Lake Visitors Center. 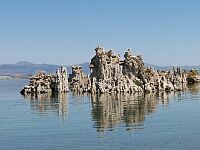 Mono Lake, Aug. 13, 2006. Click thumbnail for larger pictures. The number of people in your group. While staying on the boardwalk, go down to where the water is located and post the coordinates. Overachivers can figure out the difference in height and calculate that rate. Thanks to the Bernd das Brot Team for letting me revive this earthcache.